Well its Thursday again and that can only mean one thing - another chance for me to showcase the talents of some of my fellow demos as part of our Project Share Project. Last week I showed you projects from Amanda, Heidi and Verity so today I have chosen different members of our team - Angelina, Sally and Helzie. First up is Angelina, aka Intatwyne Designs. Angelina makes the most gorgeous boxes and bags and this project is no exception. 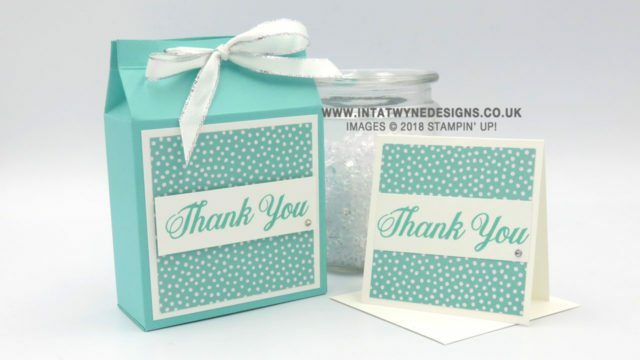 Such a lovely matching box and card which highlight so well the perfect coordination of Stampin' Up! products. Angelina has used Coastal Cabana cardstock, patterned paper and ink here. And how cute is that little card? Brill!! Next is Sally, known as Sally Stampers, who has used one of my favourite stamp sets from the new catalogue (Varied Vases) but in a very different way. Sally has used one of the little flowers and a leaf to stamp her background in a beautiful selection of colours. And again colour coordination is demonstrated by the matching cardstock, ink ands ribbon. Perfect! Last for today is Helzie, from SlimmandStylish. Helzie has made this cute boxes using a pack of DSP which is in our Buy 3 Get One Free offer this month. The pack is called Twinkle Twinkle and is soooo pretty! So I hope you've enjoyed having a little peek at these projects. I've listed a few of the products used below but just click on any of the images to go to their blogs and see more details. Meanwhile I'll be back with more team projects next Thursday and more of my own before then!